It seems as though I have an obsession with bats this year. I can’t get enough of them on my Halloween projects! This little nugget box was actually inspired by a Chinese purse that I saw recently somewhere on the internet. What is with my fascination with Chinese inspired projects lately?? Anyway, I designed my version to hold 4 Hershey’s nuggets just perfectly. I didn’t have any Halloween themed patterned paper in my stash (I rarely use patterned paper at all) so I was forced to draw my own but I think it turned out pretty cute! How did I do it? 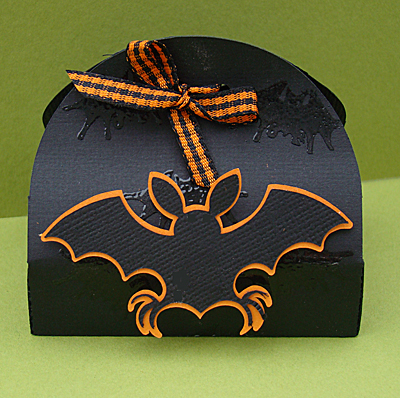 My box was cut out and then had bats heat embossed all over it using clear embossing powder. I drew the large bat myself and layered it onto orange cardstock. It was then applied to the front of my box using pop dots. For anyone wishing to purchase this template, it’s available for purchase in my Paper Templates Webstore. I have included my nugget wrappers and the bats along with the box. You are currently browsing the archives for the tag 'nugget box'.